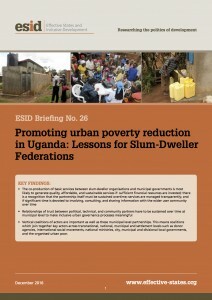 The Transforming Settlements for the Urban Poor (TSUPU) Programme was formed in 2010 as a partnership between Shack/Slum Dwellers International, The National Slum Dwellers Federation of Uganda, The Ministry of Housing and Urban Development and Cities Alliance. This partnership programme has been most effective in reducing poverty through enabling the co-production of basic services between the organised poor in slum dweller organisations and municipal governments. Vertical-level coalitions, which join together key actors across transnational, national, municipal and settlement levels, are important in addition to municipal-level partnerships.